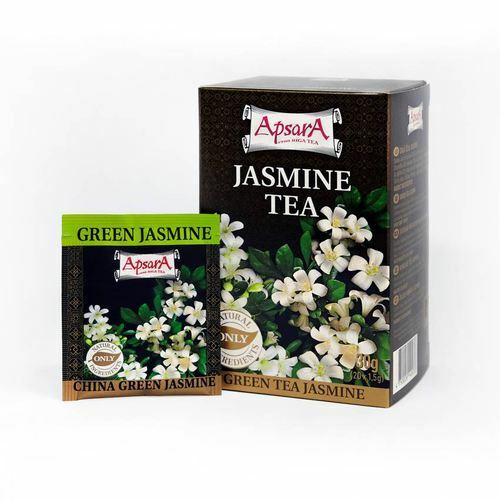 Green tea „ Jasmine Tea”. Ingredients: Chinese green, jasmine tea, 100% pure, natural product. Taste: very fragrant and delicate, with clean and fresh taste of jasmine. Brewing instructions: Boil fresh water and cool it down untill 75C. Use 1 teabag per 200ml of water. Recommended infusion time is 2-3 minutes. Features&recomendation with food: Evening tea. In combinations with fish&sea food, as well as with dishes of South Asia cuisine. Product highlights: We’re very much proud to add into our offer this lovely jasmibne tea, which is essential part of Chinese tea culture. Teas are packed with highly sophisticated device, providing ever tea bag with a knoted string and tag. Envelopes are sealed for freshness and protection of tea.